New satellite Astra 2G is preparing to go live, providing TV and radio services to Sky and Freesat users in the UK and Ireland. SES is expected to confirm soon that the satellite is ready to go into service. Expats, who have been gradually losing channels as a result of the reduction in signal overspill in continental Europe will soon find out how many channels they will continue to receive after the final set of changes to the satellite fleet serving Sky and Freesat users. Astra 2G is the final part in a multi-year scheme that has seen older satellites taken out of service and replaced by newer craft. 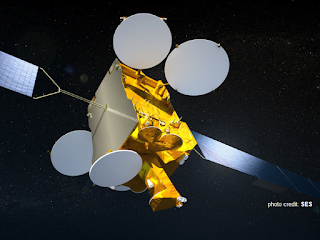 Astra 2G will begin to take services from other satellites from this week. Numerous channels will begin moving, mostly from the Eutelsat 28A satellite. ITV is reportedly also moving services across to Astra 2G. Sky and Freesat viewers in the UK and Ireland should notice no changes, apart from a short overnight break in service as channels migrate. While reception in the UK and Ireland will improve thanks to the UK spotbeam deployed on all newer satellites, the spotbeam makes it increasingly difficult for expat viewers beyond the Netherlands, Belgium and northern France to receive UK TV via satellite. As expat viewers are deemed outside of the core coverage area for UK satellite TV, there are generally no public statements from broadcasters detailing any coverage changes. The Astra 2D satellite, which provided carriage for most of the main UK free-to-air channels, during the 2000s, is now being moved out of the way. The satellite ceased to transmit UK TV channels in 2012 following the end of its active life. It was the first satellite to have a dedicated UK spotbeam. Until then satellites had a pan-European footprint enabling reception across the entire continent and beyond, forcing broadcasters who could not afford or justify acquiring programme rights for the whole continent to remain encrypted. The UK spotbeam enabled the BBC, ITV, Channel 4 and 5 to go free-to-air on satellite for the first time, much to the joy of expat viewers living around the fringes of its footprint in western Europe. Astra 2D has remained in orbit next to other active satellites since 2012, but is now being maneuvered out of the way and will eventually be sent off into a graveyard orbit when it can't be used for occasional feeds anymore.